i have been feeling under the weather sicksicksick with a head and chest cold for the past three weeks. it's v. tiresome, and in my state of lumbering phlegmosity i find it rather funny that whilst my natural inclination is to take an axe to my chest to rip my lungs out, the only things that really seem to make me feel better (besides that lovely course of antibiotics), is plain rice and weak tea. i have also turned to the rather delicate combination of both, ochazuke, many a time in these past few weeks. 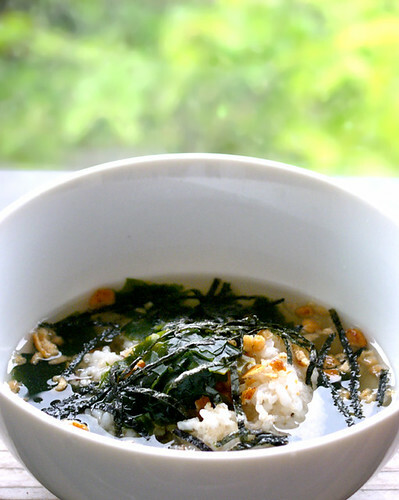 ochazuke is a light japanese dish that is a combination of hot rice with green tea or dashi (fish stock) poured over it (ocha-tea + tsuke-moisten), with a few toppings or garnishes. typically these include nori (roasted seaweed), wakame (seaweed), tiny rice pellets or crushed arare rice crackers, tsukemono, umeboshi (pickled vegetables, sour plums), dried bonito shavings, or tarako (cod roe), but aren't limited to these options in any way. also, you are not limited to what kind of tea you use--while brewed sencha or bancha (regular green tea) is the norm, hojicha (oven-roasted green tea) and genmaicha (green tea with roasted rice) are often used, and i have tried it with some black teas like oolong as well (however, matcha--the powdered green tea that is used in a lot of the desserts on this blog--isn't appropriate in this case). i have to admit, that when i am at work (yes, i go to work sick; i work in a medical office and i have coughed on people. you call it rude, i call it repeat business. kidding. sort of. 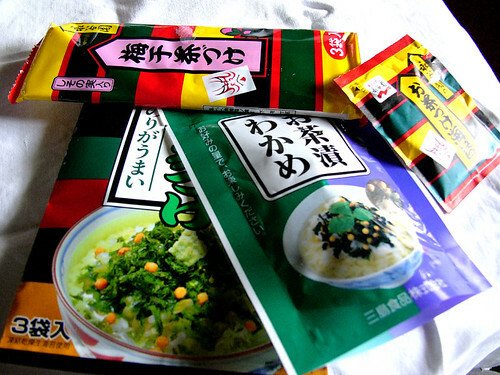 ), i tend to rely on the many packaged varieties of ochazuke available. however, it is simple enough to make it on your own with whatever ingredients you have on hand. i have eaten some form of ochazuke for breakfast, lunch, dinner, or sometimes just as a snack. in the mornings, i tend to go quite simply with white rice, wakame and nori seaweeds, some crumbled rice crackers and brewed green tea. it is very mild, slightly salty, toasty, filling and happily provides me with enough caffeine to jump start my day. 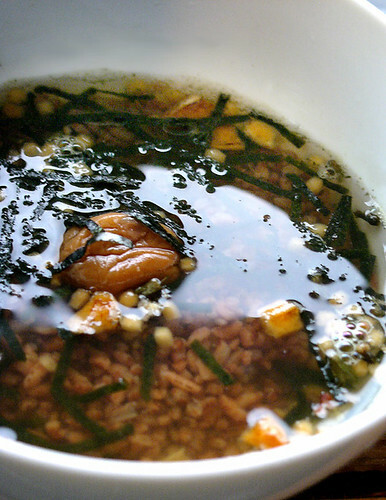 if i need a little more of a wake-up call or a pick me up at work, i will add umeboshi (sour plums), for a little bit of a kick, switch out the white rice with some brown or red rice, and pour out half tea, half dashi or konbu seaweed stock. i do rather love that i can finally put my lovely totoro bento bowl to use at lunchtime; i go the local japanese deli and pick up a few yaki onigiri (grilled rice balls), which i use in place of the steamed rice altogether--this along with one of the little ochazuke packets and some tsukemono pickles, make me a happy little bento boxer. since i am on the mend, i have been adding a little bit of fish to my tsukemono for an island-style poke (a hawaiian fish salad, pronounced 'poh-keh'). a little bit of raw ahi (yellowtail) and gochujang (kimchi paste) add some needed protein and a garlic and spicy pepper kick that is better than any over-the-counter prescription medication for clearing out the sinuses. 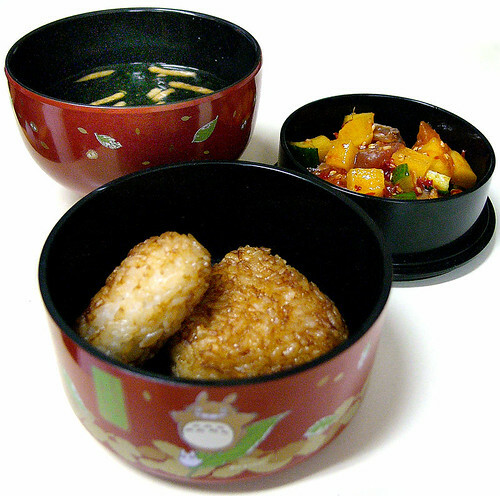 there's more on ochazuke on maki's, chika's, hanna's, mari's, and alice's respective blogs. read up, eat up! 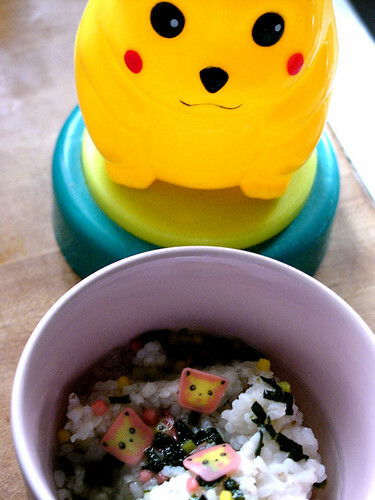 wee update 03 october: pokemon ochazuke ! shape 1/3 to 1/2 cup of rice in an onigiri mold, cookie cutter, an appropriate measuring cup or freehand it; pack it firmly together so it doesn't fall apart. sprinkle a little salt on both surfaces, rub lightly. grill the patties on a preheated grill or griddle (a very hot pan will work, too), until golden brown. brush lightly with soy sauce at least once during cooking. salt the diced cucumbers lightly, then set aside for at least 10 minutes. place the cucumbers on a clean kitchen towel, then squeeze lightly or pat firmly to remove some of the excess moisture. combine them with the diced takuan and ahi in a bowl, drizzle with the toasted sesame oil, toasted sesame seeds and green onions, then toss. add gochujang to taste. add salt if necessary. keep refrigerated until ready to serve. tsogb food photography tips nos. 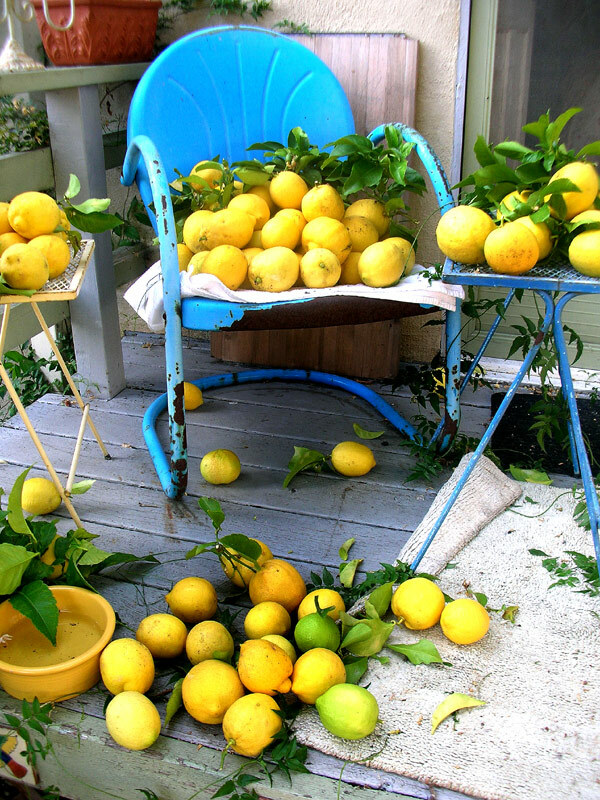 6 and 666.
when life gives you lemons, photograph 'em. food photography tip no. 6: trust your eye. before you say you take bad photos, step back and take a look; your photos may not look like x's or y's, but is that really a bad thing? don't let dissatisfaction cloud your judgement about how good your photos probably are already. find the beauty in what you do. and take more photos for experience and to find your style. final tip, no. 666: don't steal anyone else's photos--almost always you'll get caught out. ask permission to use a photo first. 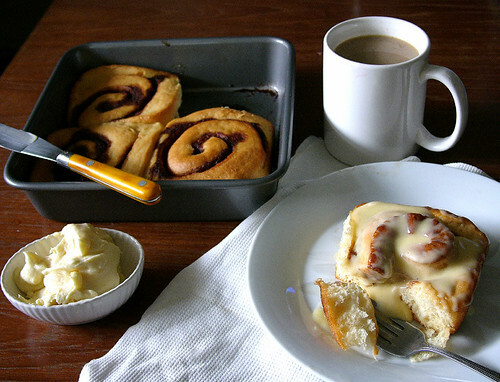 tsogb food photography tips nos. 4 and 5.
food photography tip no. 4: always bring your (charged) camera with you. don't leave it charging on the kitchen counter when you are in mexico. or k-mart. food photography tip no. 5: understand the limitations of your camera, work with them. i spent about $150 on my point and shoot digital camera that has a horrible flash, and a really terrible macro lens. that means i usually shoot in natural light, and i don't take close up photos. tsogb food photography tips nos. 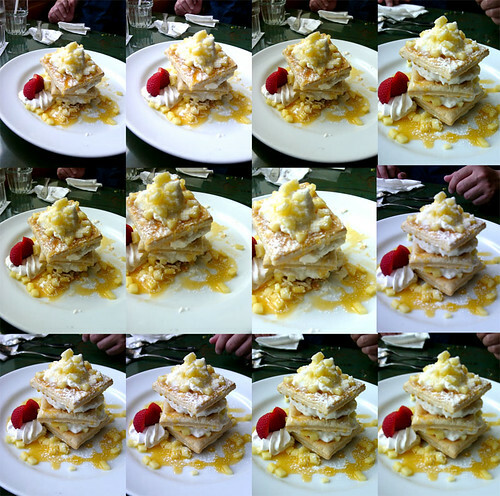 2 and 3.
food photography tip no. 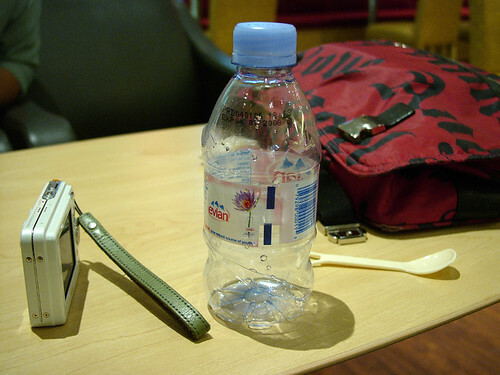 2: take multiple shots of the same subject. what you see in your viewfinder or LCD screen may not look the same on your computer at home. one of them is bound to be good. food photography tip no. 3: the prettiest photo doesn't necessarily tell the best story. tsogb food photography tip no. 1.
food photography tip no. 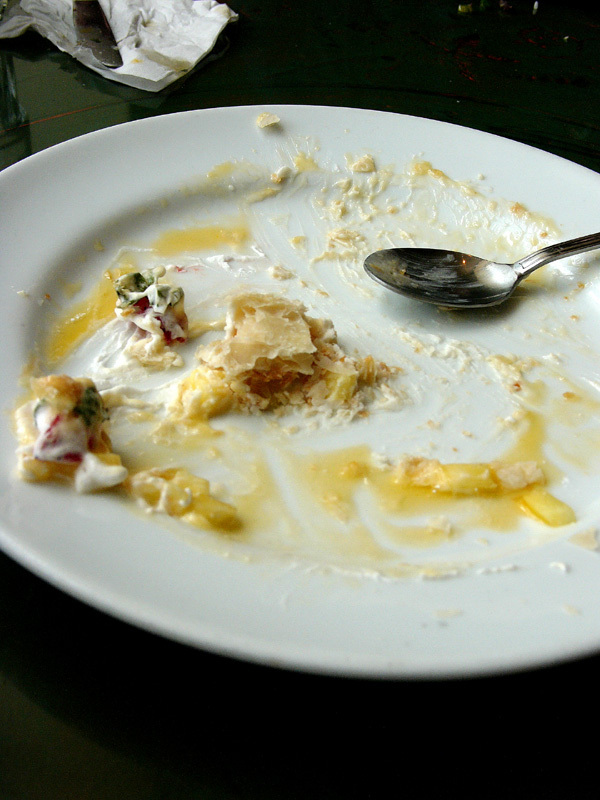 1: sometimes the best thing in a food photograph is not the food. if you are stuck taking photos of something you might find uninteresting (like, um, buffalo chicken wings), add something or someone of visual interest. i recently spent the day in saipan, our lovely neighbouring island to the north, in the commonwealth of the marianas islands (CNMI). 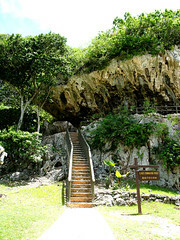 guam is the largest, southernmost island of the marianas islands chain, and is aligned with the commonwealth as being the main home of chamorro (or chamoru) culture and heritage. 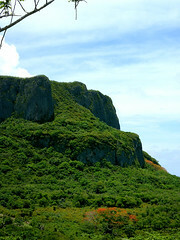 i myself am not chamorro, but as a nearly lifelong resident of guam, quite proudly guamanian; still, i have quite an affinity to saipan, as it is very much like here, only not so big (it's 14 miles long), and a little more unspoiled by modern living (although thoroughly modern in many ways). after a short 40-minute airplane ride, we decided to have a late breakfast, but unfortunately, one of my favourite restaurants, el segundo's, appears to be closed (for good? unknown. i think it might still be open for dinner service). 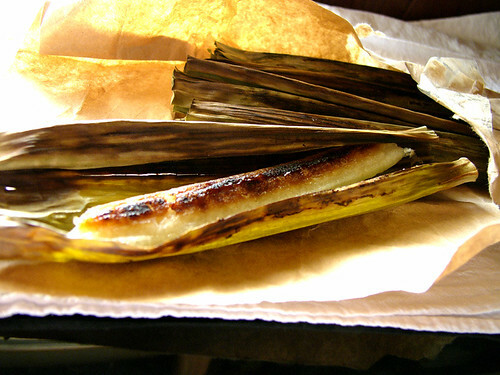 el segundo's was well-known for its chamorro breakfast specialties, including champulado with tinala katne (chocolate rice porridge with air-dried beef served on the side), and charakiles with chotda or lemai (toasted rice soup with green bananas or breadfruit). somewhat saddened by this, we made our was to a small village bakery, esco's, which is also well-known for its native delicacies. we had a bit of a tough time choosing what to get, but eventually settled on some manha biscuits made from freshly grated coconut, coconut milk and flour, just-out-of-the-fryer banana chips, and guyuria, a local cookie made from coconut milk, sugar, and flour, then coated in powdered sugar. i also couldn't resist picking up a few packages of apigigi, a local specialty made with freshly grated coconut and tapioca flour, then grilled in banana leaves. soft, sticky, smoky and slightly sweet, it is quite delicate yet earthy and irresistible. 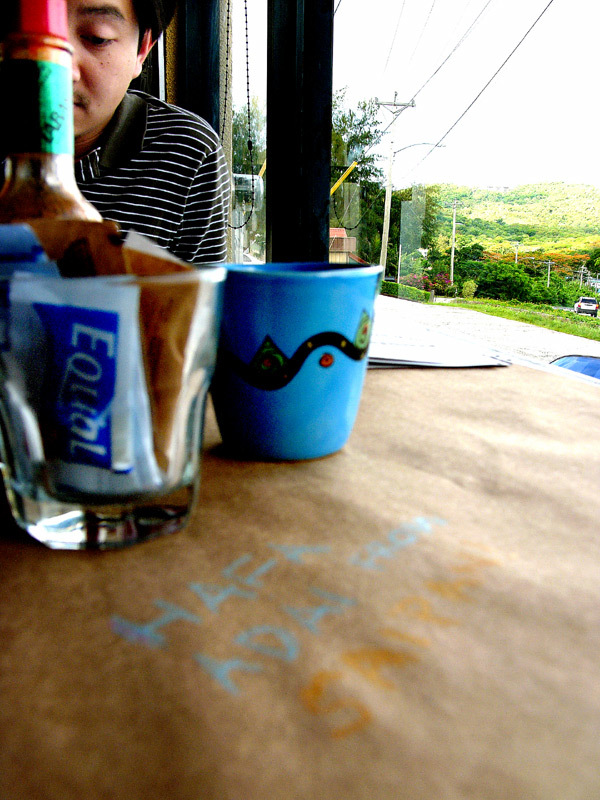 this only whet our appetite, so we went over the hill to a longstanding coffee shop, coffee care. 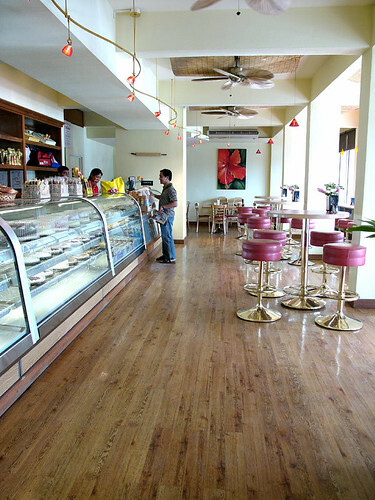 coffee care is a bright shop with a fantastic view, near the government offices of capitol hill. it used to be an ex-pat hangout, but lately has become a favourite with locals as well. although the menu is small, it is quite eclectic, and the food is fresh, interesting and healthy. 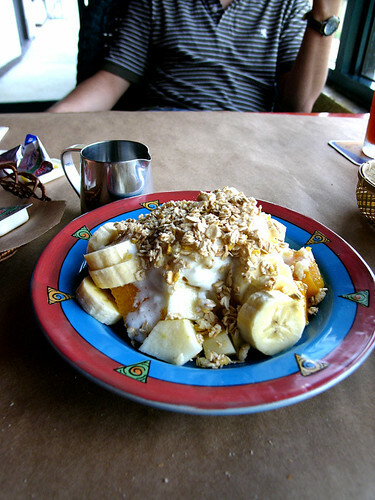 we started with a large, shared bowl of cut up fruit (nothing local, alas, just oranges, fuji apples, and bananas), greek yoghurt, and granola. 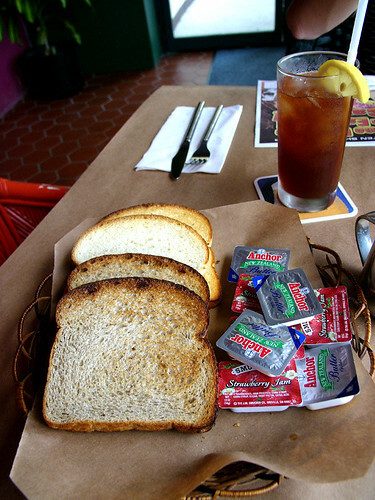 we were also given a couple slices of wheat toast and white toast, which remained mysteriously hot and toasty throughout our meal. 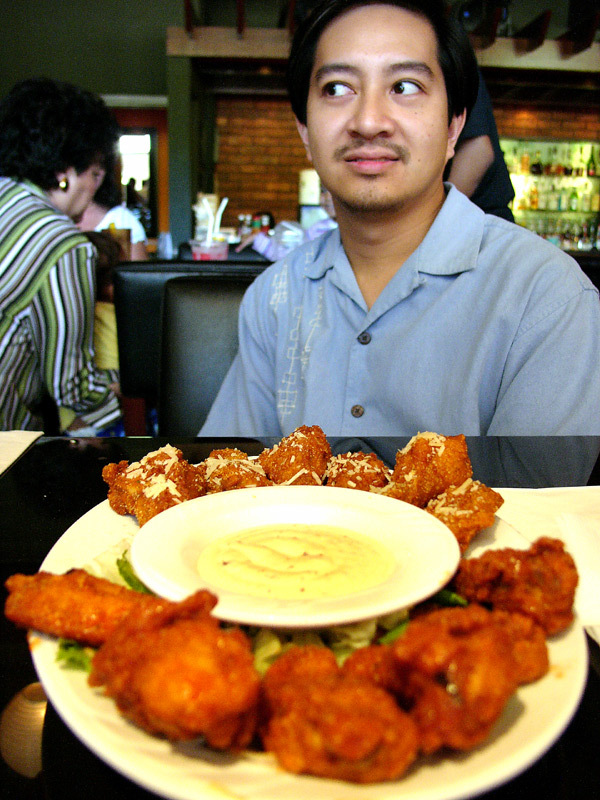 julius--cousin and travel partner--had the joe's special, an omelette based on a famous san francisco breakfast dish. 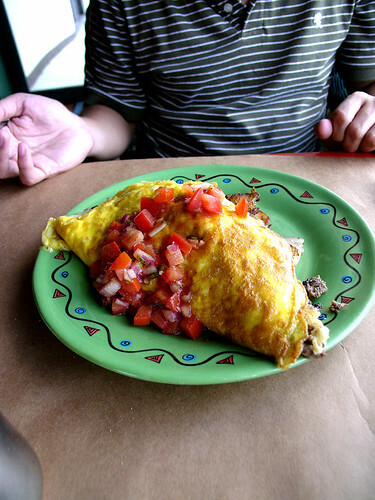 this one was filled with sauteed red potato chunks, onions, and ground beef, then topped with a fresh tomato salsa. generous and hearty. 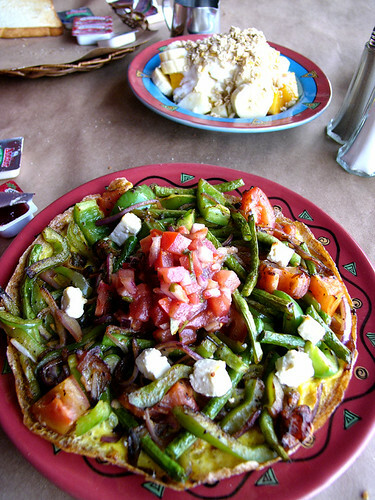 i had the veggie frittata, an open-faced omelette with a sautee of locally grown long beans and tomatoes, red onion and green bell peppers. it was topped with some kalamata olives, cubes of feta cheese, and more tomatoes. this was also a generous portion, very fresh and delicious. stuffed to the gills, we headed off for some laid-back sightseeing. 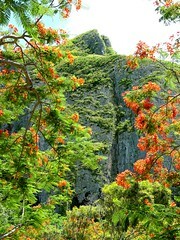 as saipan is less developed than guam, the landscape can be breathtaking for miles; flame trees line the streets and dot the valleys, along other lush tropical foliage. 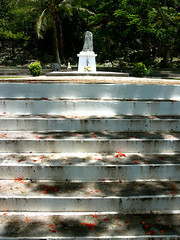 many of the attractions are related to the battle of saipan and world war 2, as it became a major battleground towards the end of the war. 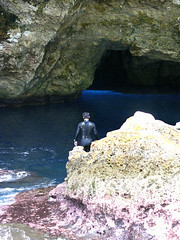 of course, the ocean vistas are stunning, as are the beaches and diving spots. although i managed to work off most of our hefty breakfast in the tropical heat, and by hiking down and up to various touristy spots, we weren't very hungry for lunch. we ended up stopping at another bakery during the shopping portion of our adventure, this time at herman's bakery (and adjacent tan marikita's café). 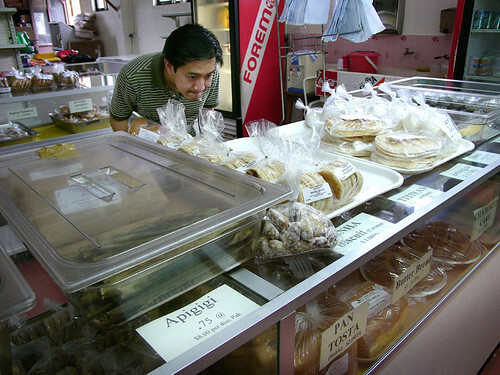 herman's is one of saipan's best known bakeries, for their bread made with the local coconut liquor, tuba, pan de leche (milk bread), and pan tosta (er, toasted bread. sort of. more like baked-until-dry bread). 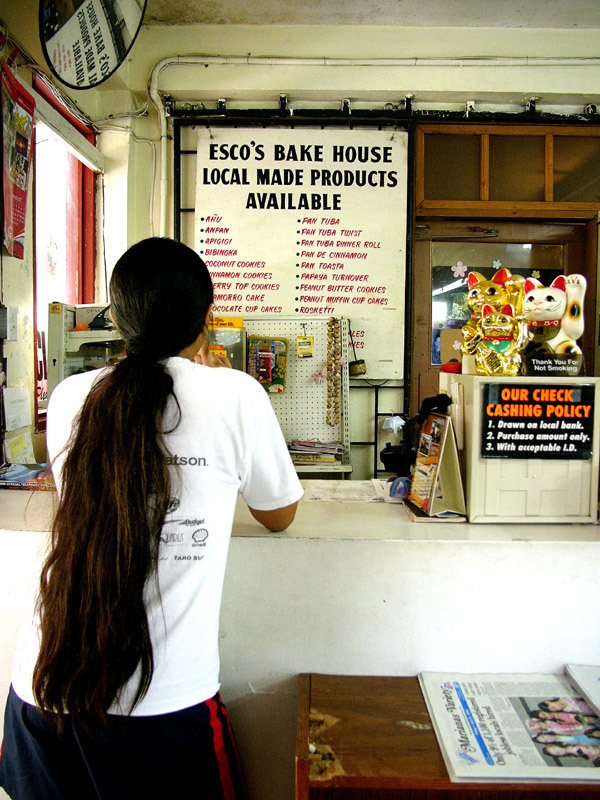 it has been open since the battle of saipan, making it the oldest business establishment on the island. however, you can see that this particular outlet isn't that old, and offered a light snacks menu besides their bakery items. i wish we had a little more time to spend on saipan; although it is quite small (you can drive around the entire island in less than an hour), there were so many little shops and restaurants i would have liked to have explored further. however, we left, stuffed and happy and luckily, i'm only a 40-minute plane ride away, so hopefully i'll have more to report in the future. 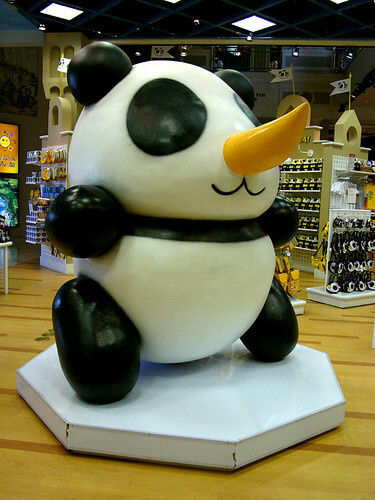 saipan's official tourist mascot, saipanda. sai in japanese means "rhino," and panda, is well, panda. therefore, crazycreepycute rhino panda! 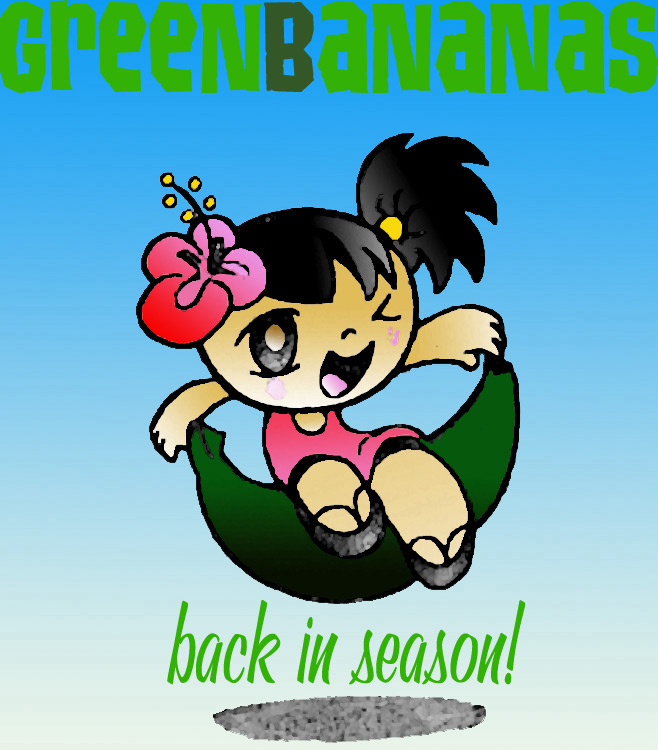 check out chopsticks, a saipan food blog! 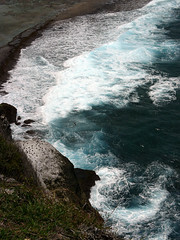 per usual, more photos of the lovely island of saipan in my i heart saipan flickr photoset. hi nenes! miss meeeeeeee??? bwaaahaaa, i know you didn't. eh. still, i'm back, and glad to see you. now i guess it means it's time to start cooking, huh? ps--my friend, greg perez, drew ms. thing up there. kawaii, ne?? (^•^) ne! see you soon!